Before there was The Sartorialist or Facehunter, there was Bill Cunningham. When I worked in New York City, one of the perks of my job was getting to go to the fashion shows in Bryant Park every season. The shows always started late and most of the time was spent people watching, spotting fashion editors and looking for celebrities. Often times I would see a cute older man in the front row, wearing a blue jacket, snapping photos. It peaked my curiousity, as most photographers were regaled to a small taped off section at the end of the runway where they had to jostle for position. 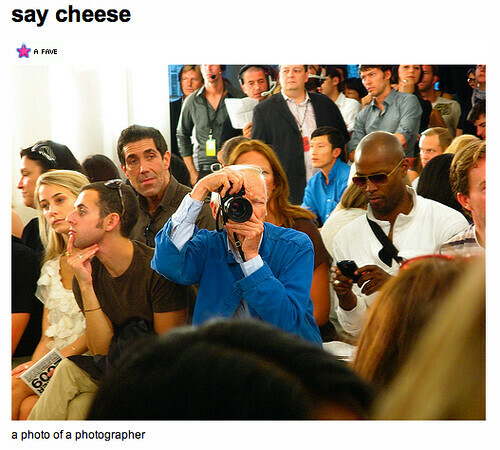 I soon learned that this was the legendary Bill Cunningham who works for the New York Times. Bill has been shooting street fashion for decades. After that I saw him everywhere, on the street, at the shows and at art openings. Twice I was the lucky subject of his lens. I never saw the photos. I’m sure they never saw the light of day, but it is every woman’s secret hope in New York to have that experience. Bill does a narrated feature now on the Times website every Sunday called ‘On the Street’, that is highly entertaining. His friendly voice and enthusiasm for fashion make it a weekly treat. The photo above was taken by annasekula at the the Y-3 (Yohji Yamamoto for Adidas) Spring 2009 show that was held inside the old Barnes & Noble store on Sixth Avenue and 21st Street. If you can’t get enough street style, I also recommend Copenhagen Street Style and this feature on Cool Hunting. oh.my.god. i’m hooked! i’m ravenous for the sartorialist [aka. my boyfriend]. but the mr cunningham’s commentary is awesome! i delighted in people watching in bryant park on a regular day, i think my brain would just explode during fashion week. thanks k! and if only i was stylish enough to be photographed by scott schuman. sigh. btw, karyn, i was looking at the workroom’s photostream…what are those hanging by the workstations??? i should really drop by and visit! mb – i want to hear all about your nyc trip! melissa – scott schuman would be lucky to photograph you! those are new clipboards (that i made) by each machine. they talk about what features the machines have and soon they will have stitching samples too! so crafty, karyn! 🙂 i can’t wait for tuesday!! !